Privacy is important to us, we want to provide you with ways to customize the OS diagnostic data, consumer experiences, Cortana, search, as well as some of the preinstalled apps, for usage with education editions of Windows 10 in education environments. These features work on all Windows 10 editions, but education editions of Windows 10 have the settings preconfigured. We recommend that all Windows 10 devices in an education setting be configured with SetEduPolicies enabled. See the following table for more information. To learn more about Microsoft's commitment to privacy, see Windows 10 and privacy. We want all students to have the chance to use the apps they need for success in the classroom and all school personnel to have apps they need for their job. Students and school personnel who use assistive technology apps not available in the Microsoft Store for Education, and use devices running Windows 10 S, will be able to configure the device at no additional charge to Windows 10 Pro Education. To learn more about the steps to configure this, see Switch to Windows 10 Pro Education from Windows 10 Pro or Windows 10 S.
In Windows 10, version 1703 (Creators Update), it is straightforward to configure Windows to be education ready. * Cortana is enabled by default on all editions in Windows 10, version 1703 If using Windows 10 Education, upgrading from Windows 10, version 1607 to Windows 10, version 1703 will enable Cortana. See the Recommended configuration section below for recommended Cortana settings. If using Windows 10 Pro Education, upgrading from Windows 10, version 1607 to Windows 10, version 1703 will enable Cortana. See the Recommended configuration section below for recommended Cortana settings. See the Recommended configuration section below for recommended Cortana settings. Use an Office 365 Education tenant. With Office 365, you also have Azure Active Directory (Azure AD). To learn more about Office 365 Education features and pricing, see Office 365 Education plans and pricing. Activate Intune for Education in your tenant. You can sign up to learn more about Intune for Education. Provision PCs with the Set up School PCs app - This will automatically set both SetEduPolicies to True and AllowCortana to False. 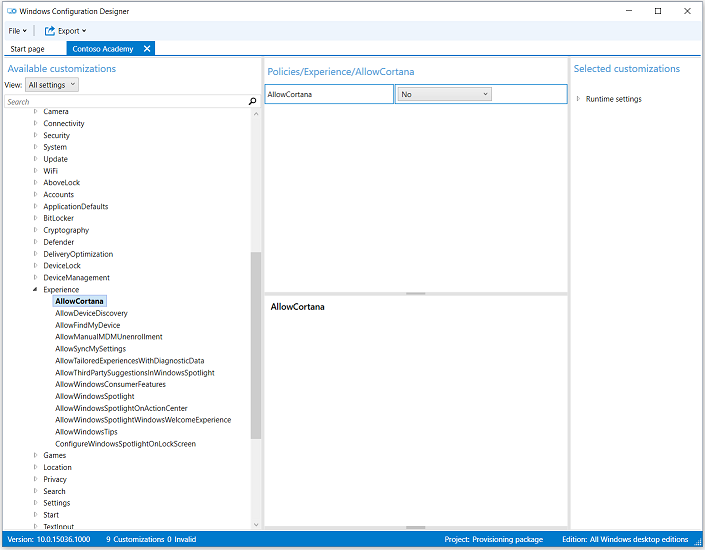 Provision PCs with a custom package created with Windows Configuration Designer - Make sure to set both SetEduPolicies to True and AllowCortana to False. Join the PC to Azure Active Directory. 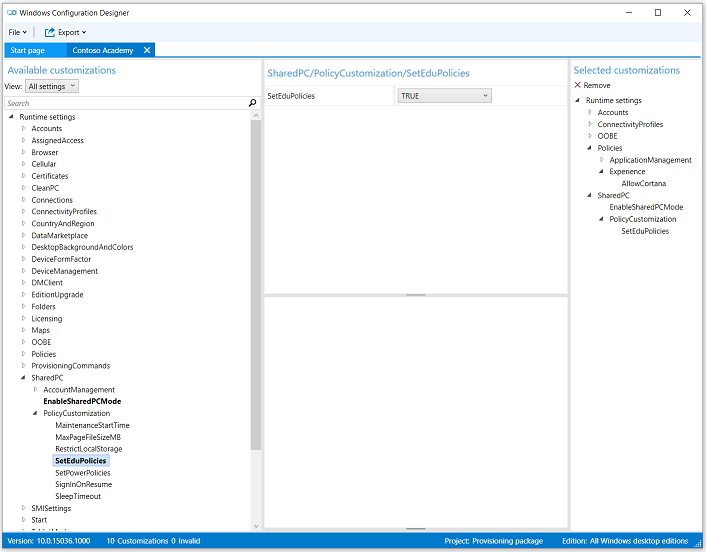 Use Set up School PCs or Windows Configuration Designer to bulk enroll to Azure AD. Manually Azure AD join the PC during the Windows device setup experience. Enroll the PCs in MDM. If you have activated Intune for Education in your Azure AD tenant, enrollment will happen automatically when the PC is joined to Azure AD. Intune for Education will automatically set SetEduPolicies to True and AllowCortana to False. Ensure that needed assistive technology apps can be used. If you have students or school personnel who rely on assistive technology apps that are not available in the Microsoft Store for Education, and who are using a Windows 10 S device, configure their device to Windows 10 Pro Education to allow the download and use of non-Microsoft Store assistive technology apps. See Switch to Windows 10 Pro Education from Windows 10 Pro or Windows 10 S for more info. Distribute the PCs to students. Students sign in with their Azure AD/Office 365 identity, which enables single sign-on to Bing in Microsoft Edge, enabling an ad-free search experience with Bing in Microsoft Edge. Ongoing management through Intune for Education. You can set many policies through Intune for Education, including SetEduPolicies and AllowCortana, for ongoing management of the PCs. You can configure Windows through provisioning or management tools including industry standard MDM. Provisioning - A one-time setup process. Management - A one-time and/or ongoing management of a PC by setting policies. AllowCortana is a policy that enables or disables Cortana. It is a policy node in the Policy configuration service provider, AllowCortana. See the Recommended configuration section for recommended Cortana settings. Use one of these methods to set this policy. Intune for Education automatically sets this policy in the All devices group policy configuration. If you're using an MDM provider other than Intune for Education, check your MDM provider documentation on how to set this policy. If your MDM provider doesn't explicitly support this policy, you can manually set this policy if your MDM provider allows specific OMA-URIs to be manually set. 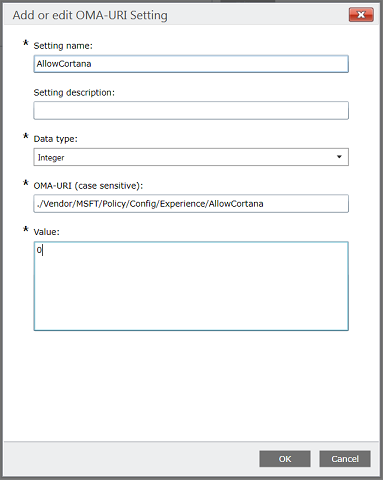 For example, in Intune, create a new configuration policy and add an OMA-URI. Set Computer Configuration > Administrative Templates > Windows Components > Search > AllowCortana to Disabled. Set up School PCs always sets this policy in provisioning packages it creates. Under Runtime settings, click the Policies settings group, set Experience > Cortana to No. SetEduPolicies is a policy that applies a set of configuration behaviors to Windows. It is a policy node in the SharedPC configuration service provider. 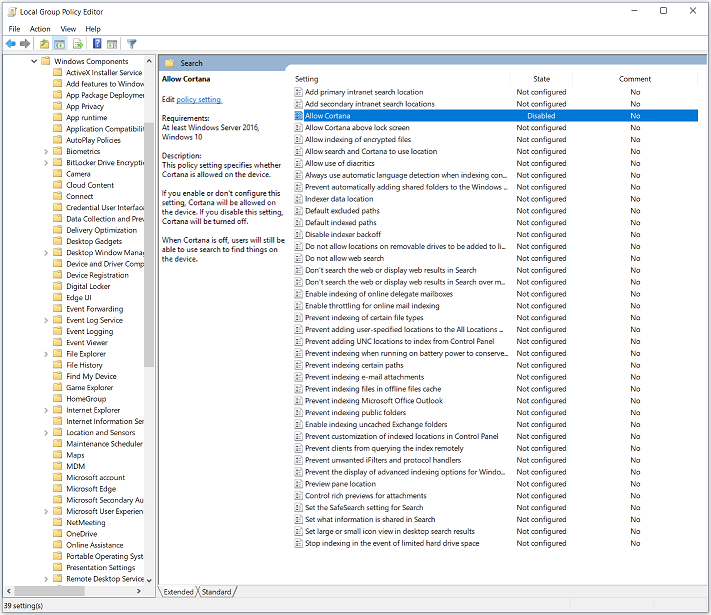 SetEduPolicies is not natively supported in Group Policy. Instead, use the MDM Bridge WMI Provider to set the policy in MDM SharedPC. $sharedPC = Get-CimInstance -Namespace "root\cimv2\mdm\dmmap" -ClassName "MDM_SharedPC"
Under Runtime settings, click the SharedPC settings group, set PolicyCustomization > SetEduPolicies to True. Provide an ad-free experience that is a safer, more private search option for K–12 education institutions in the United States. Additional information is available at https://www.bing.com/classroom/about-us. If you enable the guest account in shared PC mode, students using the guest account will not have an ad-free experience searching with Bing in Microsoft Edge unless the PC is connected to your school network and your school network has been configured as described in IP registration for entire school network using Microsoft Edge. Ad-free searching with Bing in Microsoft Edge can be configured at the network level. To configure this, email bingintheclassroom@microsoft.com with the subject "New Windows 10, version 1703 (Creators Update) Registration: [School District Name]" and the include the following information in the body of the email. This will suppress ads when searching with Bing on Microsoft Edge when the PC is connected to the school network. Ensure your Office 365 tenant is registered as an education tenant. For more information, see Verify your Office 365 domain to prove education status. Domain join the Windows 10 PCs to your Azure AD tenant (this is the same as your Office 365 tenant). Configure SetEduPolicies according to one of the methods described in the previous sections in this topic. Have students sign in with their Azure AD identity, which is the same as your Office 365 identity, to use the PC. Have students sign into Bing with their Office 365 account. For more information on all the possible Bing configuration methods, see https://aka.ms/e4ahor.